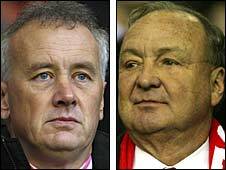 Liverpool co-owner Tom Hicks has written to the club's chief executive Rick Parry calling for him to resign. Hicks is thought to feel that Parry is siding with co-owner George Gillett in the club's ongoing power struggle. The latest twist comes on the day Dubai International Capital said it will wait for the saga to be resolved before pursuing its interest in the club. BBC Sport understands Parry is highly unlikely to resign and that Hicks lacks boardroom support for his shock move. With the club ownership split 50-50 between the two Americans, Hicks would need approval from Gillett to force Parry out of his position. But in a brief statement, Parry, who has yet to see the three-page letter, said: "It is my intention to remain focused on the job of serving Liverpool Football Club to the best of my abilities at this very important time of our season." DIC is said to be unwilling to do business while there is so much turmoil at the club. "You have two partners who do not see eye to eye. And we decided that we pull out completely. Let them sort out their problems," DIC chief executive Sameer Al Ansari told Arabian Business Magazine. He added: "We will continue to be interested and would love to own the club but we are not going to put ourselves in a difficult situation where we make the investment but we have no control over the destiny of the club and we cannot influence the success of the club. "Unfortunately, the terms that have been put on the table do not allow us to do that." Only last month, Parry asked for the Liverpool co-owners to resolve their differences. "If they're not able to co-exist then there needs to be a solution where one buys and one sells, or both sell," Parry told BBC Radio 5 Live's Sportsweek. Hicks is said to be unhappy with those comments and was not at Anfield on Tuesday night to watch Liverpool defeat Arsenal in the quarter-final of the Champions League. Gillett was shown on TV world-wide sitting next to Parry in the Liverpool directors' box. BBC Sport understands that Hicks feels that the club needs a fresh injection of commercial clout in an attempt to boost their off the field revenue. Hicks believes the club is falling behind the likes of Manchester United and Chelsea in those areas but the American also feels that Parry has failed to deliver strength and direction in the transfer market. It is also understood Hicks is aiming to take sole control of the club with his relationship with Gillett described as "unworkable". But although Gillett is willing to sell, it is thought that he is unwilling to sell to Hicks. The pair have had a tough time since taking control of the club in February 2007. Despite seeing the club enjoy some success on the pitch, with Liverpool reaching last season's Champions League final, Hicks and Gillett's relationship with manager Rafa Benitez has often been strained. Benitez has become increasingly frustrated with the lack of transfer funds made available to him over the past year, although he was able to bring in the likes of Fernando Torres and Ryan Babel. The American pair have not endeared themselves to Liverpool supporters who idolise Benitez and have shown their backing for the Spaniard with a series of rallies. Plans for a new stadium in Stanley Park have also had to be downsized due to rising costs.